Cloud9 Recording is owned and operated by brothers Joe and Jack Napoli. When I recently asked Joe Napoli why a band should choose to record at Cloud9 instead of using home gear or going to a budget priced project studio I expected an answer that addressed the technical advantages. I expected to hear about Cloud9’s new mixing console custom built by Andrew Roberts from Purple Audio, or their impressive instrument collection (37 guitars, 43 amps, many microphones & mic pre amps, numerous snare drums). I thought he’d mention the floating-room non-parallel wall construction of his facility and how that provides optimum conditions for recording music. I thought we’d talk about the flexibility of Pro-Tools editing at Cloud9 or the fact that they provide both digital and analog recording. 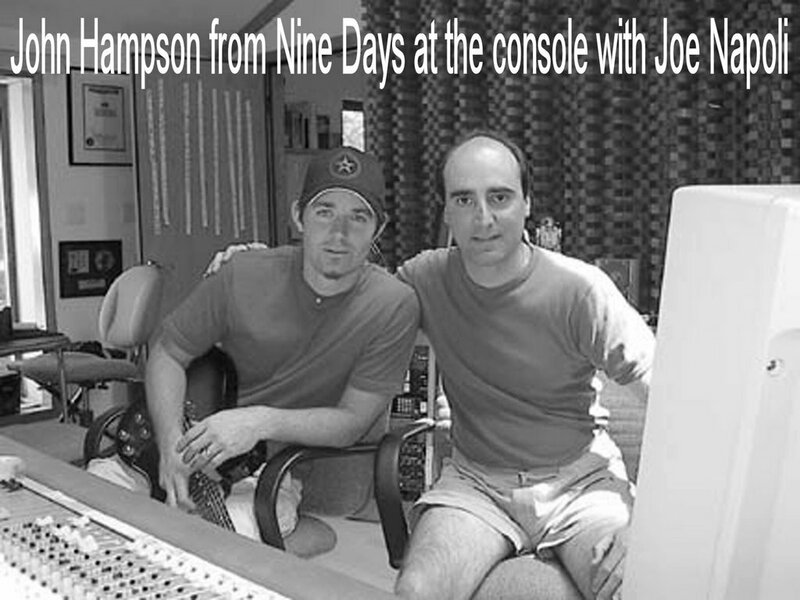 Joe and Jack’s A-game is what has attracted bands like Nine Days to record at Cloud9. It’s what recently brought a young band called The Vacancies in from Ohio to record their debut CD for Joan Jett’s Black Heart Records with Kenny Laguna producing. It brought New Jersey duo Aerial Acoustics to Cloud9 to record one of their fine CDs. Word is getting out on Long Island’s best-kept secret – this affordable pro recording studio really supports the artist. Joe speaks the truth. I’ve recorded a full-length CD and a CD single at Cloud9 and both experiences were extremely positive. I went in to each session with an ambitious list of tracks I wanted to accomplish and every day we completed my list and then went further. Over the years I’ve played in many bands and recorded in numerous studios. Cloud9 is the most artist-focused recording studio I’ve been in. As a solo artist who likes full band arrangements on my recordings, they were even able to hook me up with first-rate musicians like Meatloaf’s drummer John Micelli and Nine Days bassist Nick Dimichino for my sessions. They took the time to understand my vision and then provided the tools and talent to help me get there – and they do this for all of their clients. Local bands and solo artists, bands with recording contracts, and producers looking for great sounding performance and mixing rooms have all benefited from the commitment, experience, and excellent gear at Cloud9 Recording. Joe Napoli sums it up, “I care about my work. I love what I do. This is the best job in the universe for me.” His enthusiasm and dedication to his craft are evident as soon as you walk in the studio – it’s a great place to make a record. To learn more about Cloud9 Recording visit their website: www.cloud9recording.com. What was your inspiration for modern jazz samba? In my opinion was the bossa nova, and Brazilian choro genre, especially the flute very well played. Qual foi a sua inspiração para modern jazz samba? Na minha opinião foi a bossa nova, e o genero brasileiro chorinho,principalmente a flauta muito bem tocada. What was your inspiration for modern jazz samba? In my opinion was the bossa nova, and Brazilian choro genre, especially the flute very well played. Qual foi a sua inspiração para modern jazz samba? Na minha opinião foi a bossa nova, e o genero brasileiro chorinho,principalmente a flauta muito bem tocada.